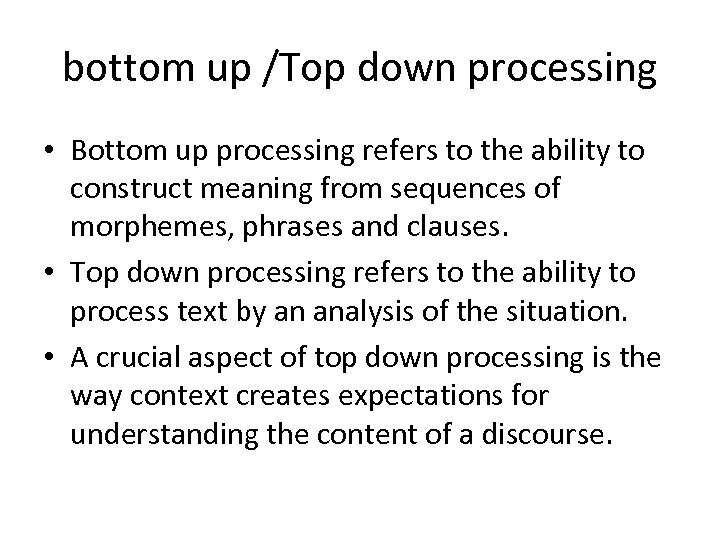 bottom up /Top down processing • Bottom up processing refers to the ability to construct meaning from sequences of morphemes, phrases and clauses. 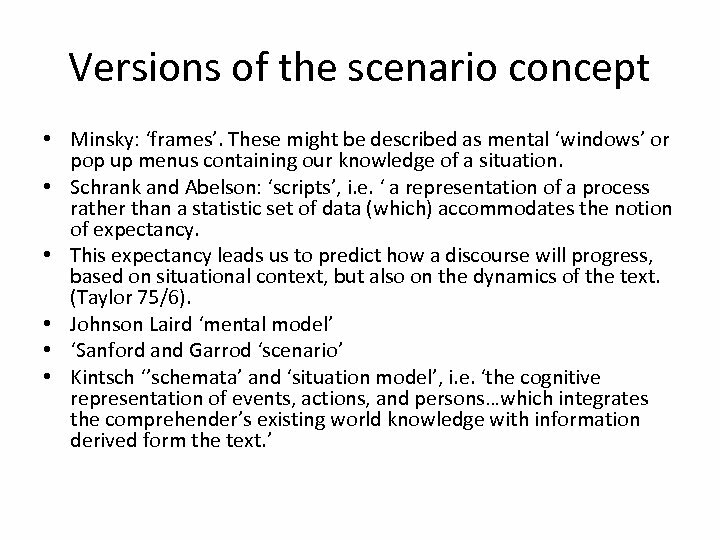 • Top down processing refers to the ability to process text by an analysis of the situation. 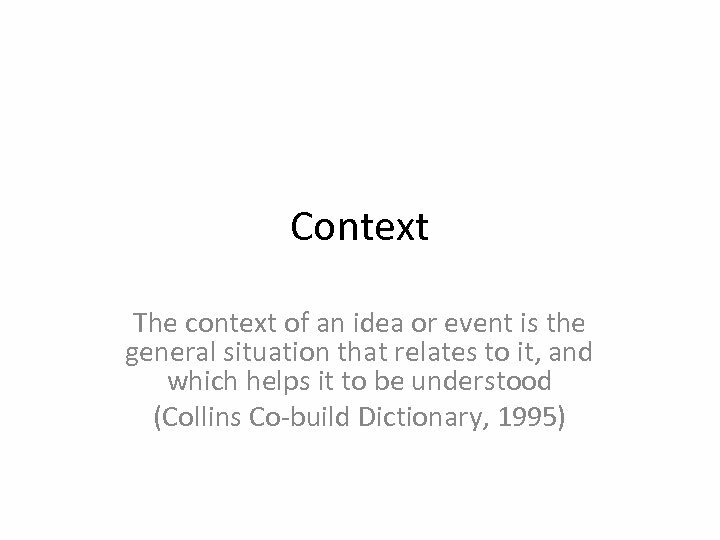 • A crucial aspect of top down processing is the way context creates expectations for understanding the content of a discourse. 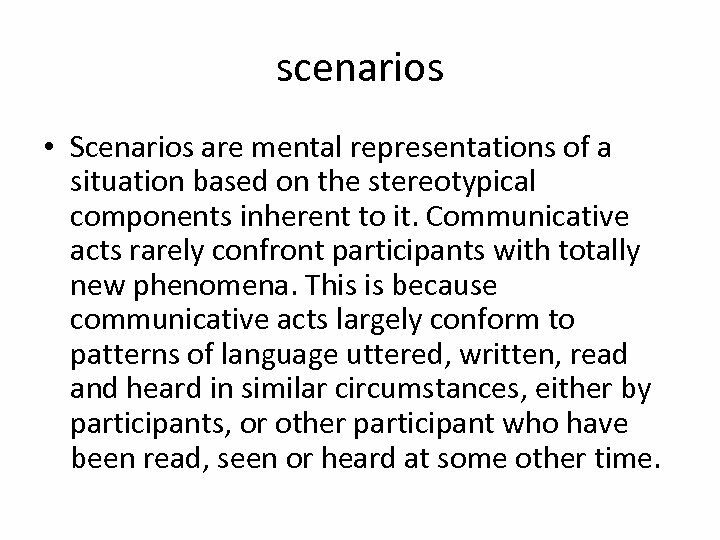 scenarios • Scenarios are mental representations of a situation based on the stereotypical components inherent to it. Communicative acts rarely confront participants with totally new phenomena. 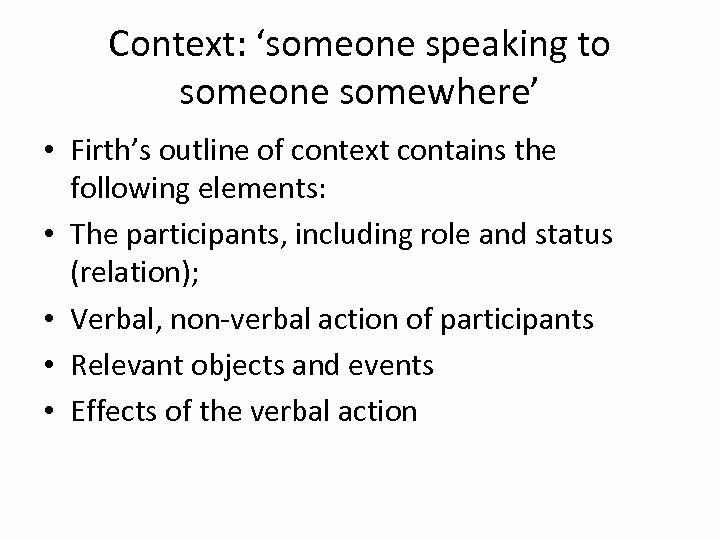 This is because communicative acts largely conform to patterns of language uttered, written, read and heard in similar circumstances, either by participants, or other participant who have been read, seen or heard at some other time. 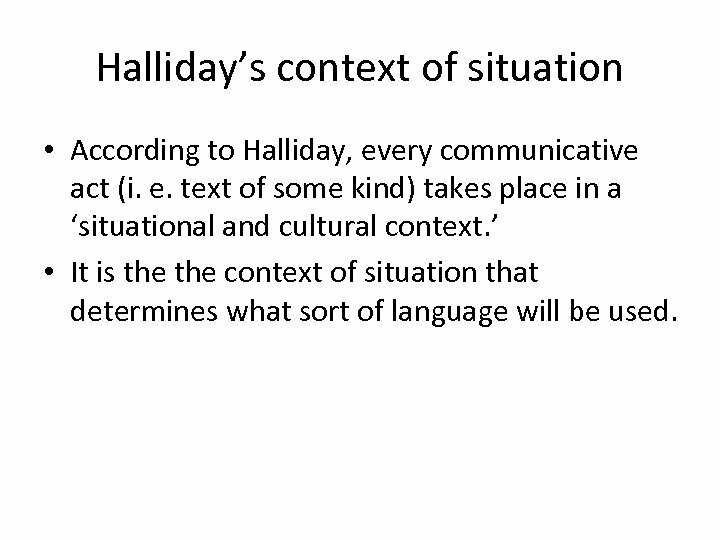 Halliday’s context of situation • According to Halliday, every communicative act (i. e. text of some kind) takes place in a ‘situational and cultural context. 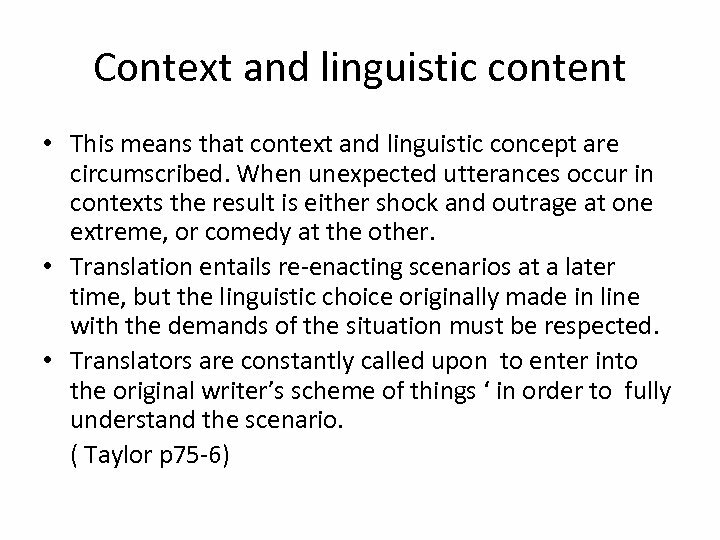 ’ • It is the context of situation that determines what sort of language will be used. 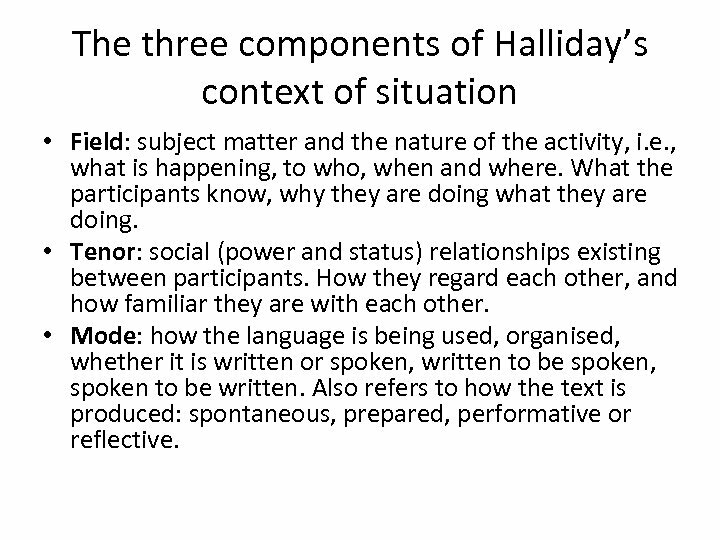 The three components of Halliday’s context of situation • Field: subject matter and the nature of the activity, i. e. , what is happening, to who, when and where. What the participants know, why they are doing what they are doing. • Tenor: social (power and status) relationships existing between participants. How they regard each other, and how familiar they are with each other. • Mode: how the language is being used, organised, whether it is written or spoken, written to be spoken, spoken to be written. 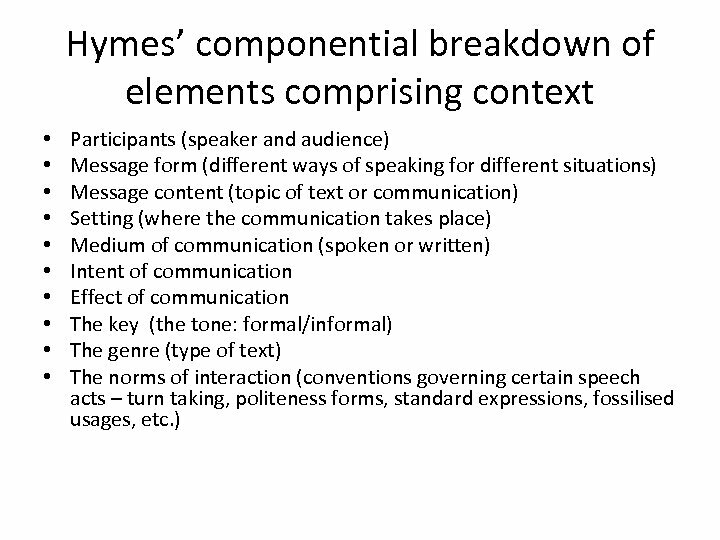 Also refers to how the text is produced: spontaneous, prepared, performative or reflective. 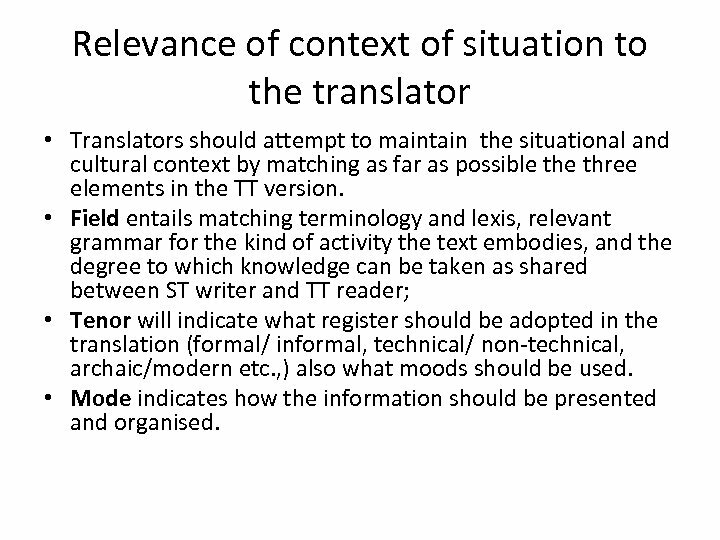 Relevance of context of situation to the translator • Translators should attempt to maintain the situational and cultural context by matching as far as possible three elements in the TT version. 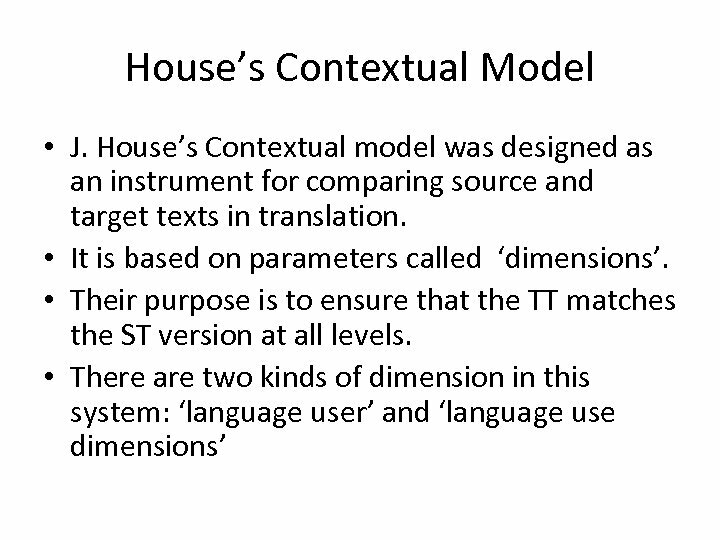 • Field entails matching terminology and lexis, relevant grammar for the kind of activity the text embodies, and the degree to which knowledge can be taken as shared between ST writer and TT reader; • Tenor will indicate what register should be adopted in the translation (formal/ informal, technical/ non-technical, archaic/modern etc. , ) also what moods should be used. • Mode indicates how the information should be presented and organised. 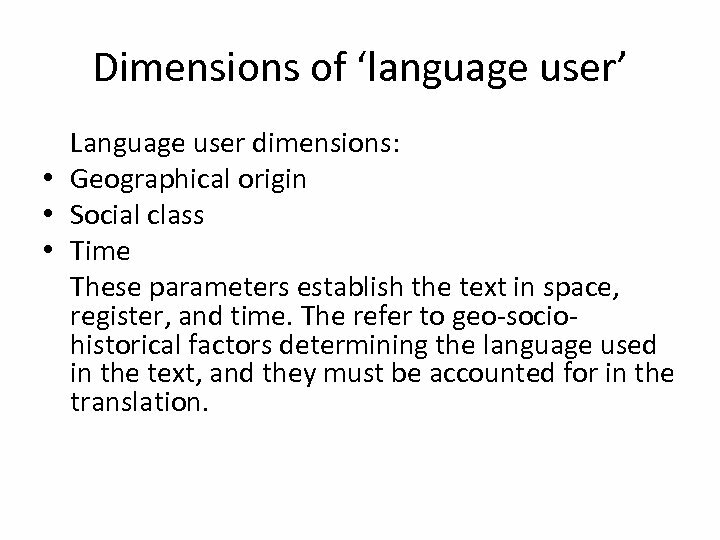 Dimensions of ‘language user’ Language user dimensions: • Geographical origin • Social class • Time These parameters establish the text in space, register, and time. 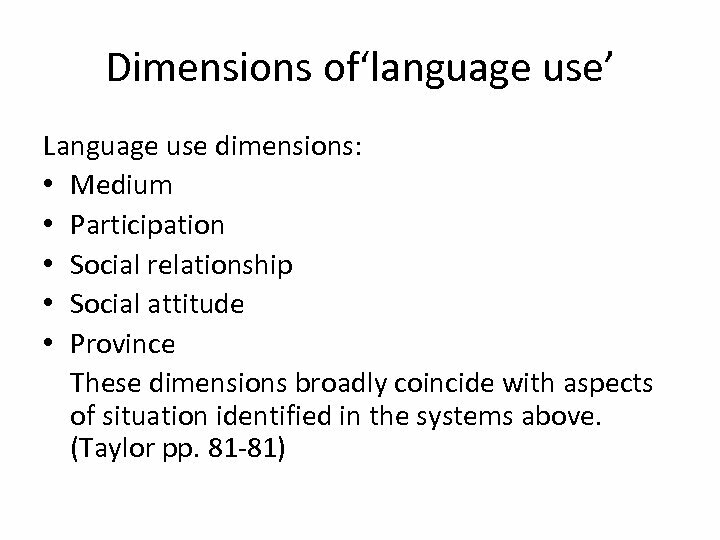 The refer to geo-sociohistorical factors determining the language used in the text, and they must be accounted for in the translation. Лекция 1 Литература: Романцов А. Н.
Единый информационный портал в сфере event индустрии. Организация, обеспечение ипроведение деловых мероприятий исобытий.